TRIIIBE is a collaborative that obscures the seams of authorship, fusing the input of several parties, most prominently that of photographer Cary Wolinsky and triplets Alicia, Kelly and Sara Casilio. In the way one can imagine the social futility of distinguishing identical sisters growing up, the collaboration required by a multi-media production (including performance, photography, and installation) evades singularity. In fact, TRIIIBE’s intent is to shake-up and shift familiar modes of behavior by confusing boundaries and challenging definitions of self. TRIIIBE raises critical dialogue in their work through usurping stereotypes, borrowing outward signs of observed identities. Like the identity chameleon Nikki S. Lee, TRIIIBE takes dress-up to an uncompromising, passable extent. The difference is, TRIIIBE is not infiltrating social contexts to be subsumed and accepted, they seek visibility in order to call our social constructs into question. Their work also relates to the persona shifting of icon Cindy Sherman, however, the tripling of TRIIIBE’s dress-up brings a whole new measure of disruption to identity politics. Picture three identical women dressed in an exacting fashion and behaving in unison in public. Imagine riding the train to work on a Wednesday morning and seeing three indistinguishable women wearing matching business suits, while periodically sipping their coffee in unison. The tripling of outfit and gesture infuses a lucid consciousness into an otherwise mundane, habitual circumstance. Suddenly, our compliance with a daily routine is disrupted by the extraordinary, and our patterns start to look like choice rather than inevitability. In a number of their pieces, the triplets take on three distinct, yet conflicting identities, complete with passable signifiers—a hoodie, a burka, or heels. In these constructed circumstances, they are often performing the same gesture—leaning against a bar or standing frontal to the camera. The uncanny result is that they are each dressed in shocking, disruptive difference, yet their faces and bodies are clearly discernable as being the same. Picture three women standing side-by-side holding their pregnant bellies—one looks punk, one preppie and the other Latina. Despite the striking independence of their attire, the sameness of their circumstance, gesture, and faces brings attention to commonality, and calls to question the superficiality of difference. Identity starts to look like a performance, and the question arises, at what point does difference become a construct? Whether they are dressed identically, or whether they each adopt characteristics that are in sharp contrast to one another, it’s impossible to look away from the performances and photographs of TRIIIBE. In the same way, you can’t take your eyes off of a car accident, or a deformity, TRIIIBE’s work provokes a visceral uncertainty and an indulgent fascination. TRIIIBE has performed at Institute of Contemporary Art, Boston, Republican National Convention, samsøn, Ground Zero, and Massachusetts College of Art. Their work has been covered by New York Public Radio, The Village Voice, Boston Globe, Forbes Online, Chronicle, Channel 5, The Improper Bostonian, and Philadelphia Weekly. The Casilio triplets received their BFA from Massachusetts College of Art where they received the Steven Paine Scholarship and the Crosby Sculpture Award. Wolinsky is a notable photographer who shot for National Geographic for 35 years, co-founded Picture Network International and the Center for Digital Imaging Arts at Boston University, has been published widely, and is in the collection of the Museum of Fine Arts, Boston, deCordova Museum, Fogg Art Museum at Harvard University, Tikotin Museum Haifa, and the Cleveland Art Museum. Barbara Wolinsky and their son Yari Wolinsky run Trillium Studio with Cary, supporting the design and film components of the collaboration. Fine art printer: Bob Korn, Bob Korn Imaging. Colophon page design: Barbara Wolinsky, Trillium Studios. 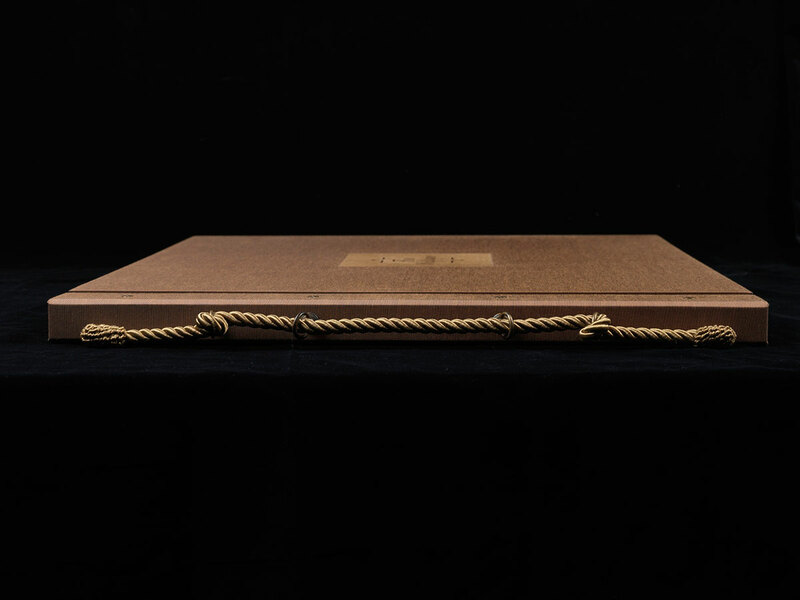 Book artist: Daniel E. Kelm assisted by Leah Hughes. 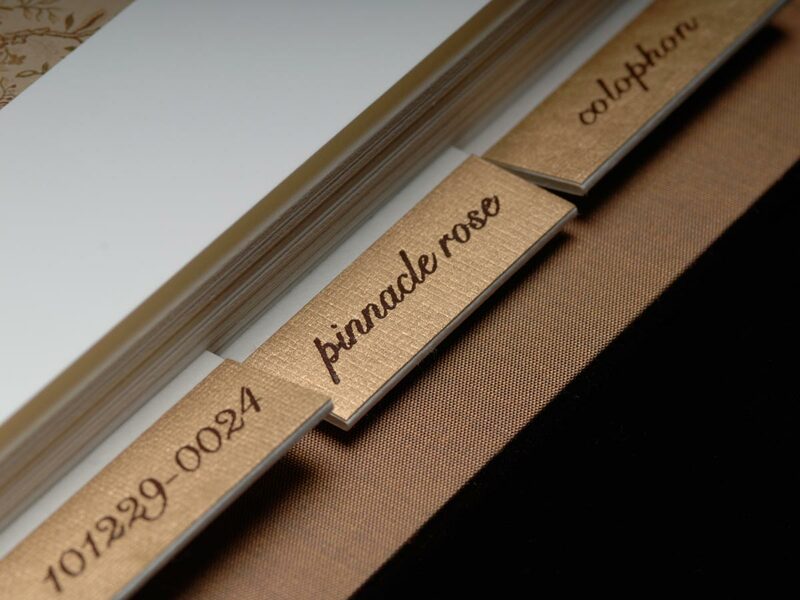 The text and photographs are printed on Optica One, 300 gram 100% cotton paper using Ultrachrome pigmented ink. 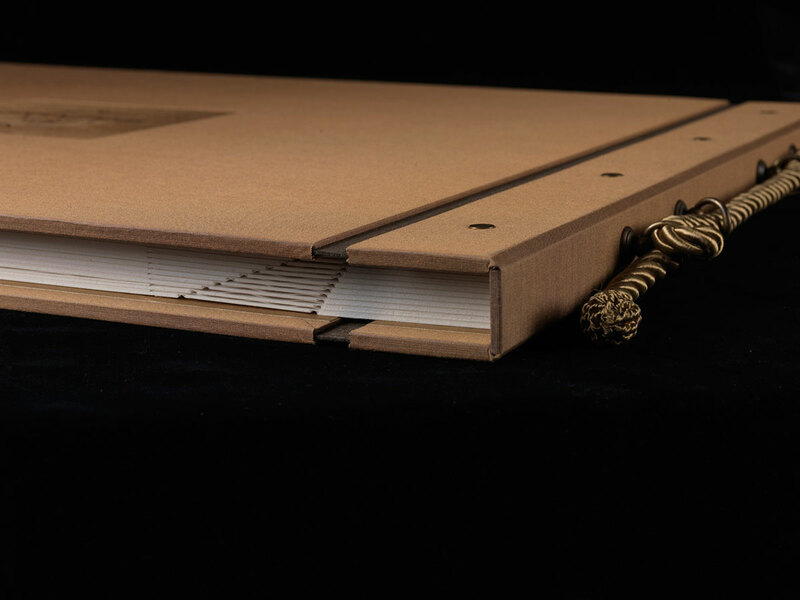 The pages are separated by archival glassine sheets and Cresent antique tan museum boards. 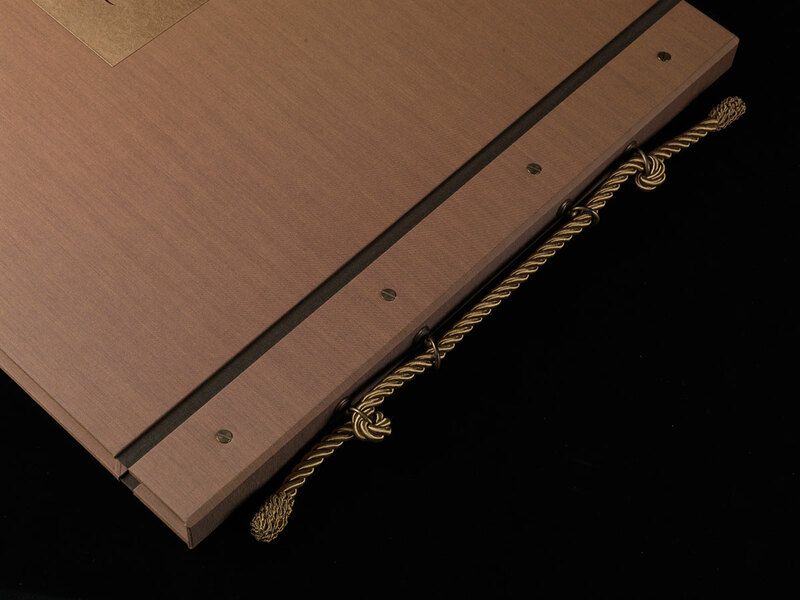 The book is bound in Japanese Ginga bronze bookcloth over boards with Indian metallic cover gold endpapers and brass Chicago screw post binding. A handle made of passementerie is attached to the spine using brass fittings. 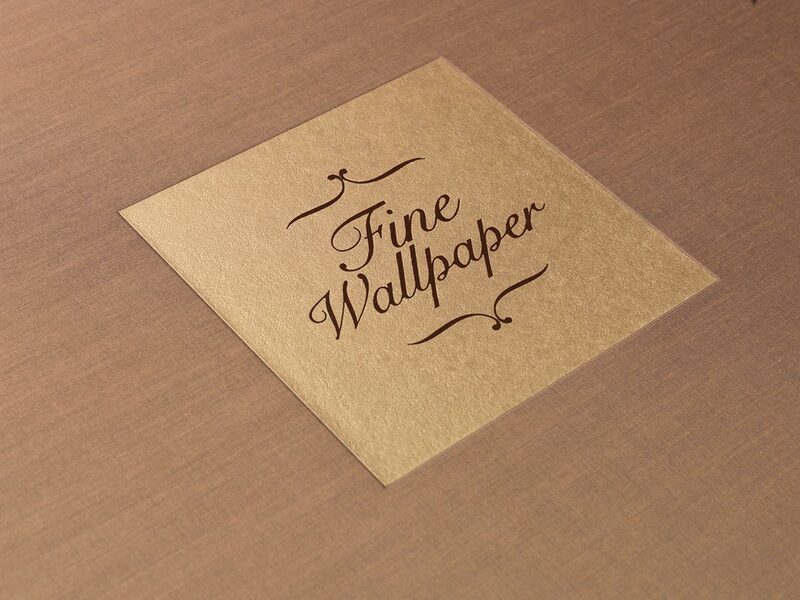 Fine Wallpaper is held in private collections. 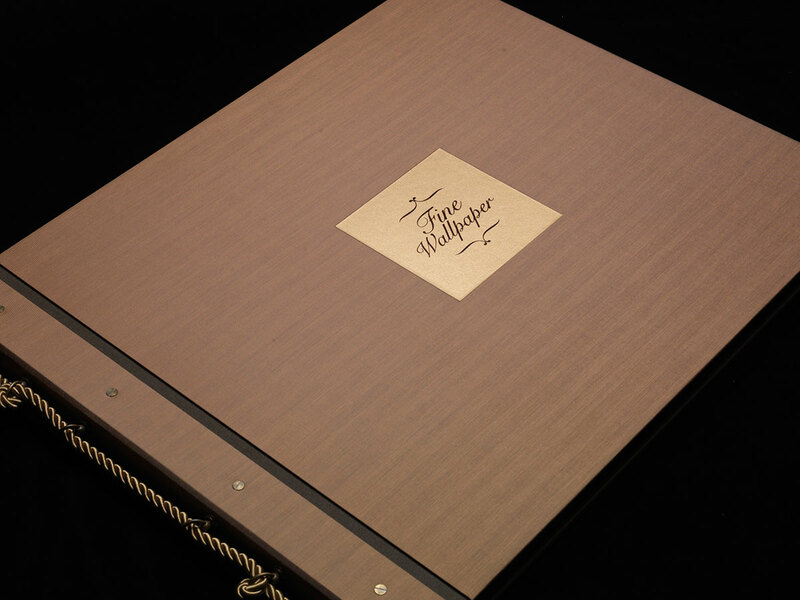 TRIIIBE is represented by Gallery Kayafas in Boston and DODGEgallery in New York City, and you may view Fine Wallpaper at these locations. Kelm foil-stamped the title onto the same Indian paper used to line the covers. Detail of the front cover. The tabs were stamped to match the front cover label. 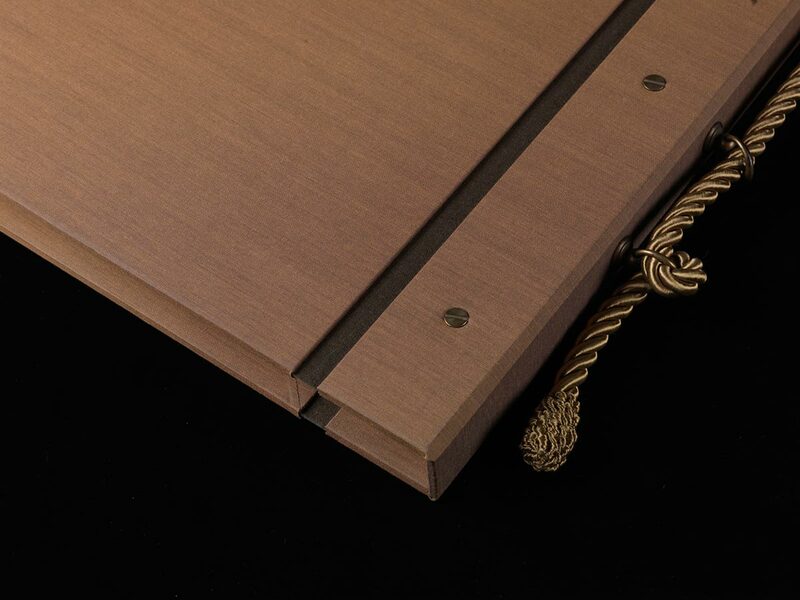 A handle made of passementerie is attached to the spine using brass fittings. It is evocative of wallpaper sample books. 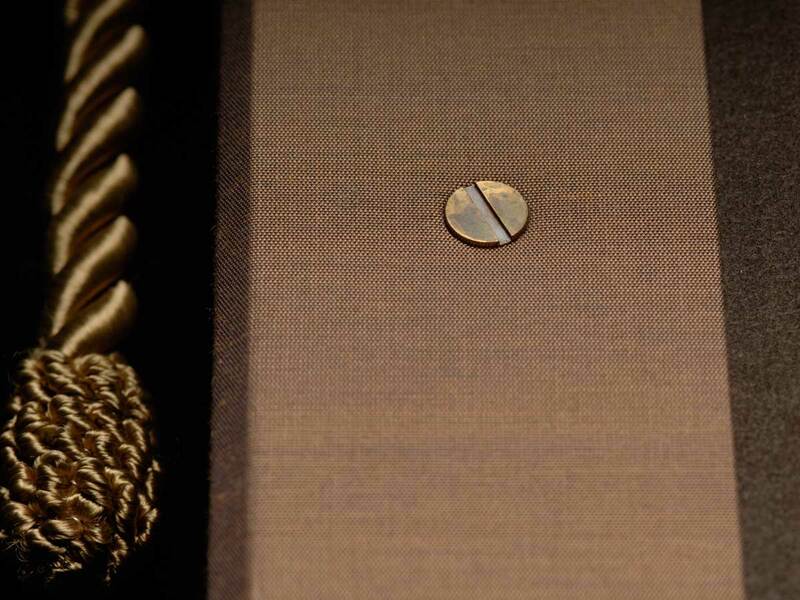 Kelm patinated the Chicago screw post to complement the handle hardware. Detail of the spine and head of the binding.